A thrilling science fiction, mixed with romance and a fast-paced plot. Madhavi is one among group of five friends, fresh out of engineering college, who land jobs in different cities of Iddis. But before their lives can take off, war comes. 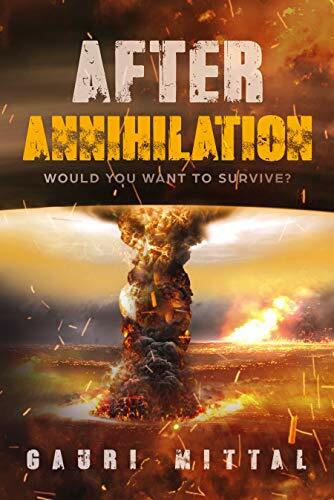 In a series of sudden, blinding flashes of light, millions of lives are lost, incinerated in the fiery heat of a nuclear exchange that threatens to end the human race forever. At first, it seems Madhavi is the only one left alive in a world that has been devastated by global conflict. With nuclear fallout set to eliminate any survivors, finding sanctuary seems impossible, until she is rescued to Shunya, where begins a life she never wanted to live. A post-apocalyptic novel and a war and survival fiction. Gauri Mittal is a doctor. She belongs to Dehradun, India, having completed her education and medical graduation from the city. Currently she is pursuing MD. She writes fiction, poetry and short stories. She wrote her first novel on wattpad and has since then published the one and others on Amazon. Starting of with the blurb it makes you want to read as it’s short and crisp. The cover depicts end of the world and nuclear attacks which are happening Varshi. The story starts of with the story of 5 college friends and how life takes a turn for them when they get their placements in Varshi. I really liked the first half of the book which was described in detail and followed a sequence how it all felt like a dream within few hours everything changed for them. The first few pages where Madhavi gets into a cave and is saved due to the dog. The only survivors left Aarav, Shunya and a few others. It also makes you realise how to save the world now or else it could be our earth in few years. The story follows through and pace keeps variating. The very vivid and live details of the events really keeps you interested in reading the book. It is a very unique concept which really thrilled me to read. Brilliantly written.